The post-convention bounce is now moving in the Republican direction, but with an enormous spread in estimates. A Gallup/USA Today (9/5-7) has an enormous 10 point McCain lead over Obama, 54%-44%. In contrast, Gallup's tracker over the same days shows a 5 point McCain lead, 49%-44%. Now would be a good time to note that the tracker is a registered voter (RV) sample, while the Gallup/USAT is a likely voter (LV) sample. LV samples typically are more favorable for Republican candidates, so at least some of this difference is probably due to these different sampling frames. We'll no doubt be talking a lot about this issue in days ahead. But other polls on the same days show a tied race. Diageo/Hotline has the race 44%-44% and CNN has it 48%-48%. And Zogby's Internet poll done 9/5-6 puts the race at 50%-46%. All of these are much better for McCain than the 5-9 point Obama leads we saw in the immediate aftermath of the Democratic convention. So it looks like both parties got nice convention bounces. Our trend estimate is still hungry for more data. The standard, blue line, estimate is now less persuaded that Obama had a convention bounce OR that McCain is getting one either. That is standard behavior of our estimator which is designed to be a bit conservative when faced with conflicting polls and short term changes of trend. But that is why we have our "sensitive" estimator for comparison. The red line is a trend estimate that is about twice as sensitive a the blue line. It is considerably quicker to respond to short term changes and to fewer polls. The down side is it will often chase random noise. Since there is good reason to believe convention bounces are real, it is reasonable to think that the red line's indication that the race has indeed tightened is probably a real signal in the data, and not just noise. On the other hand, the Gallup 10 point McCain lead is out of the range of any other current polling data. So "red" may be chasing that outlier just a bit more than is good for him. As the figure makes clear, red and blue usually agree quite closely after enough data are in hand, but can diverge especially when data are sparce. 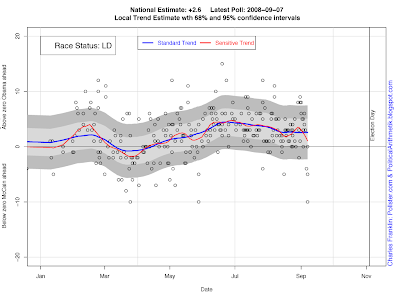 A prudent approach is to wait for a few more post-convention and post-weekend interviewing polls to see just how big and how sustained the RNC bounce is. But both estimators agree we have ourselves a real horserace now.